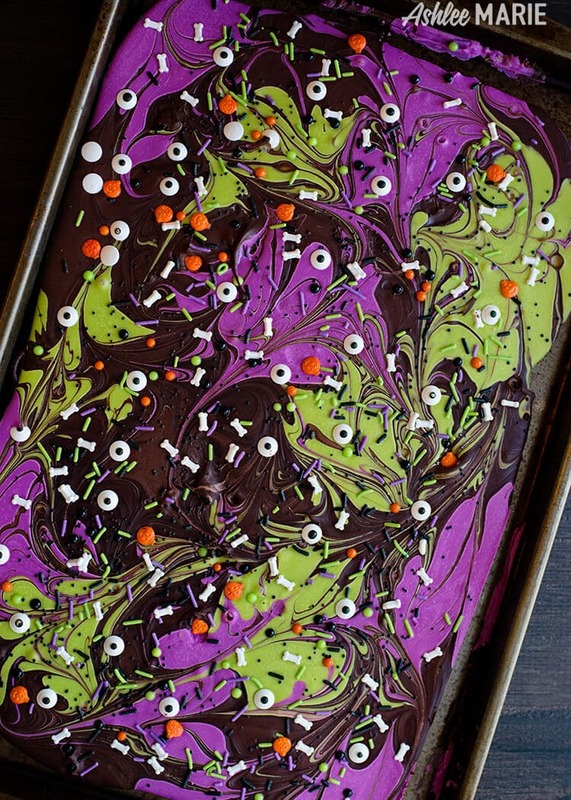 Want more creepy desserts? Check out my fun Halloween Ebook! Filled with family friendly spooky treats. 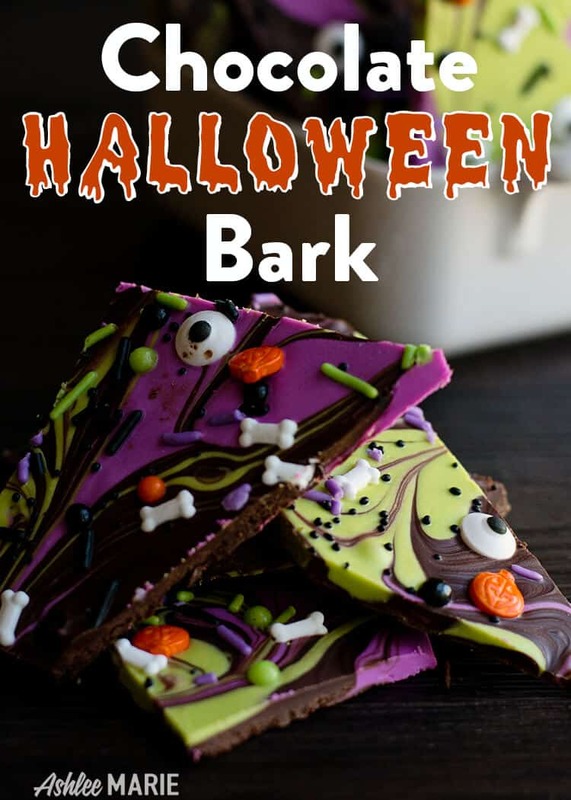 Chocolate Bark is one of the easiest things you can make and to personalize for any holiday or event. 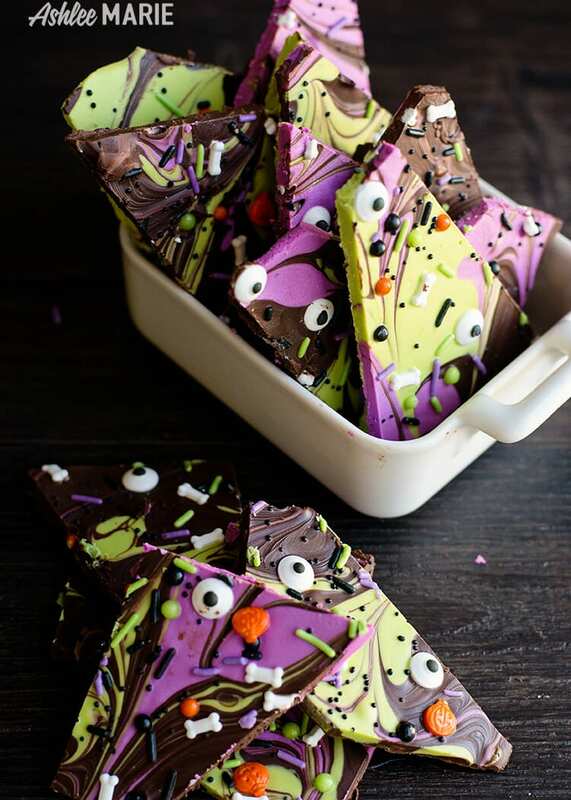 All you need to do is change up the color of the chocolate (pre colored candy melts are perfect for this) and switch up the themed sprinkles you use every time. The mistake I tend to make is to use too much chocolate and spreading it too thick! I just get scared it’s too thin… Like this cake with chocolate bark shards on the top. So when I made this batch I made sure to use less chocolate and I was super happy with the end result! I greased a plain pan for but you could also use a silpat mat, or wax paper or even parchment paper to easily life and break the chocolate after it’s set. Seriously it’s so simple and my kids love making it. Line a jelly roll pan with parchment paper or a silpat mat. Melt chocolate and candy melts in separate bowls. Drop onto the pan in random spots. Shake the pan to “flatten” and spread the chocolate. 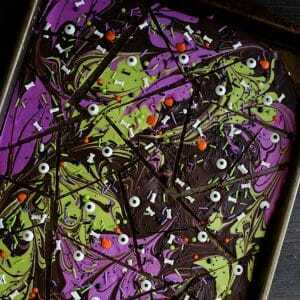 Use a knife to swirl the colors together. Shake to again spread and flatten more. 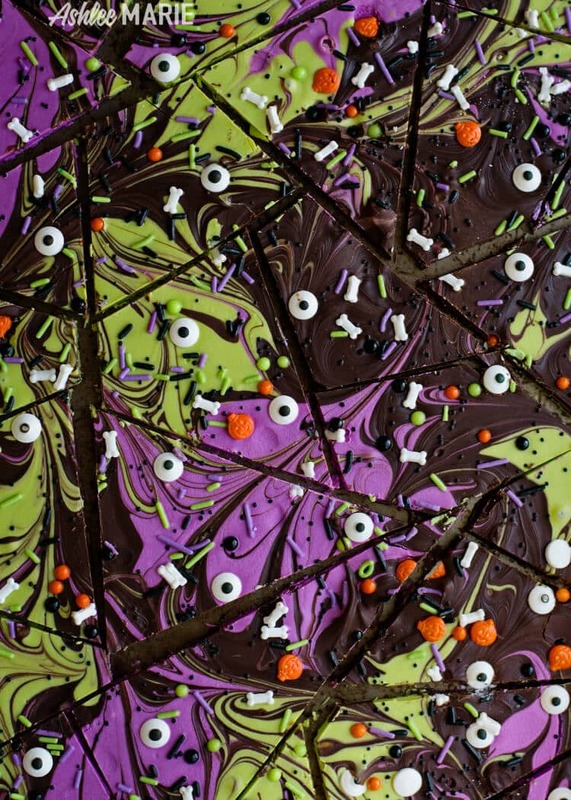 Spread the halloween sprinkles and candy over the chocolate. Let set and break into shards. And that’s all there is too it! Easy peasy and always popular. This is so fun! I love the colors, and those little bones are awesome! Thank you so much – there are so many fun sprinkles these days!